Claim: 400 PPM CO2 gives the weather 'personality' of the extreme kind – rebuttal to CBS News Face the Nation | Watts Up With That? The desperation to link this tornado event to climate change in some way, even though the science says otherwise is palpable. An analysis follows. BOB SCHIEFFER: And welcome back to FACE THE NATION Part Two. For Page Two today we thought we’d explore a subject that affects everyone–the weather. So we have convened a panel of experts to tell us how bad things are going to get this summer and beyond. Heidi Cullen is the chief climatologist for Climate Central which is an independent organization of scientists and journalists who study the climate, now it’s changing; Jeffrey Kluger is an editor-at-large for TIME Magazine. He co-wrote this week’s cover story on the Oklahoma Tornado; David Bernard is with us in person today. He usually joins us from his weather watching post at WFOR TV, our CBS affiliate in Miami; and Marshall Shepherd is the president of the American Meteorological Society. He is in Atlanta this morning. Doctor Shepherd, I want to start with you because we’ve had floods. We’ve had droughts. We’ve had tornadoes. We’ve had superstorms. It’s cold when it ought to be warm and it’s warm when it is supposed to be cold. I guess, you know, if it starts raining frogs that’s probably the only thing we haven’t had so far. What is happening? Is this something different? Is this just a cycle? What’s going on here? J. MARSHALL SHEPHERD (American Meteorological Society/University of Georgia): Yeah, well, it really– and– and I’m a professor at the University of Georgia and here in– in Georgia, we’ve actually had almost all of those examples that you just gave– tornadoes in Atlanta. We flooded in 2009, a really bad drought. I– I think it depends on which– which phenomenon you talk about. Certainly, as I often say, weather is your mood and climate is your personality, so on any given day you can have really cold weather or really violent weather, but the scientific literature, including our recent AMS Climate Change statement, does suggest that our climate is changing and I think we can say some things about certain weather phenomenon and climate phenomenon that are more linked to this climate change and we are in a different climate system now. Almost every weather phenomenon happens in a warmer and more moist climate. And so I– I think we do see some changes in our climate and some responses in our weather. I– I– I think it’s a bit premature to say that there is a definitive link between that Moore tornado last week and– and– and climate change. But I think more research is needed there. BOB SCHIEFFER: Well– well, Jeff, is there any consensus about what is causing this? JEFFREY KLUGER (TIME): Well, in the case of the tornadoes, as Doctor Shepherd says, we’re reasonably sure that there is no link. And– and in fact, to the extent that climate change plays a role, the variables kind of neutralize one another, you get an increase in warm moist air, which feeds tornadoes, but you also get a decrease in the updraft, the vertical shear, so they sort of cancel each other out. I think what we see though the fact that we crossed four hundred parts per million of CO2 in the atmosphere just last week. This is the highest it’s been since the Pleistocene era when there were forests in Greenland and sea levels were sixty feet higher than they are now. As recently as 1958, it was only three hundred and fifteen. So, we have supercharged, super accelerated CO2 input into the atmosphere and this I think is what’s driving so much of the mood or the– the personality, the climate change variables we see. BOB SCHIEFFER: Doctor Cullen, there’s no question that it’s getting warmer. We have a graphic here that just shows 2012 was the hottest year on record. It shows how much hotter it was. The entire country was affected. Is this going to get any better or is it going to get worse? HEIDI CULLEN (Climate Central): It’s not going to get any better if we don’t do anything about it. I mean right now we’ve added about a degree and a half of extra warming to our atmosphere, the planet is that much warmer. And so what we are talking about is how does that extra degree and a half affect our day-to-day weather? And so right now I’d say that, you know, the jury is still out as to how global warming will affect tornadoes, which of those two variables will win out. But when it comes to things like heat waves, when it comes to things like heavy rainstorms, drought, wildfires, we know that, you know, the– the atmosphere is on steroids, if you will. So basically, you know, we know that we’d have to deal with weather-related risks. 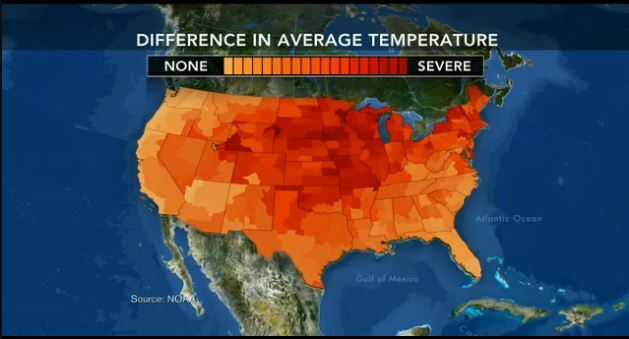 We live in a country that has always seen extreme weather. We’re basically moving in a direction where we’re going to see more and more of certain of these extremes and– and as we heard before that– that stuff is really expensive. BOB SCHIEFFER: Well, but what is causing this? HEIDI CULLEN: So, basically, add additional heat to the atmosphere, suddenly, you’re now adding more moisture to the atmosphere, so we know that certain kinds of extreme events are going to happen more frequently. 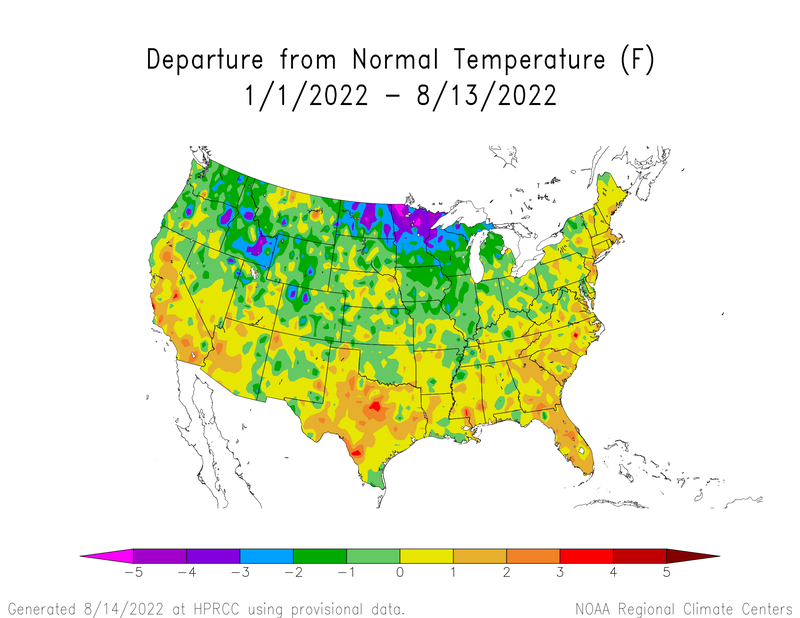 So the heat wave that would only happen, say, one in a hundred years is now going to happen say once every fifty years. The statistics, if you will, the likelihood of seeing a certain kind of extreme increases just by the virtue of the fact that the planet is warmer, and then also when it comes to storms there is more moisture in the atmosphere. Those storms can now rain down more heavily and basically at the same time we’ve got more people in harm’s way. We saw that with– with Moore, Oklahoma, as well. So, you know, this combination of– of amplifying risks, more people in harm’s way, a warmer planet with more moisture to– to bring more storms into– into play, it basically just increases our vulnerability across the boards. BOB SCHIEFFER: All right. Dave Bernard, you’re our man on the hurricane watch. We talked to you many times during hurricane season and the bad news is NOAA has come out with hurricane season predictions that say it could be worse this year than it– than it was last year. They’re predicting a likelihood of, I think, thirteen to twenty name storms of which seven to eleven could become hurricanes. DAVID BERNARD (WFOR Miami): Well, you know, the key here is we have been in a climate pattern for the last twenty years of excessive storms in the Atlantic Basin. That climate pattern, Bob, is still in place, so that’s the reason why we’re looking at an elevated number of storms. Now, of course, the key everywhere year is, where do these storms go? That’s one thing that we really can’t tell ahead of time. Last year, there were nineteen storms and basically we had Isaac hit Louisiana and, of course, Superstorm Sandy. But the majority of the storms, they stayed out to sea. But with a forecast like that and the potential for more land falling storms, I– I think there could be even a– a greater impact and what we learned from Sandy and even going back to Hurricane Katrina and basically what Doctor Cullen was saying, we have more people now living on the coast than ever before. So the impact potential really is that much greater and we have to learn how to mitigate against these storms. Clearly, that was not done in the Northeast. We’d gone so long without a significant hurricane there. We’ve seen that in other areas. We have to learn to live with these storms and going forward since we don’t know exactly where this climate pattern may take us. With a warming world we have to learn to adapt to these storms as well. BOB SCHIEFFER: Well, Doctor Shepherd, let me just cut to the chase here. Are we doing something here on Earth that is causing the weather to change or is this just one of the cycles that– that what we go through? J. MARSHALL SHEPHERD (American Meteorological Society): Yeah, this is a question I often get, Bob. Of course, I mean, it’s amazing to me when someone comes up to me and says “Doctor Shepherd, the climate change is natural.” I say, of course, it does. I should send my degree back to Florida State University, if I didn’t know that. But what’s most important about that is that on top of this natural variability, as– as Heidi mentioned, we now have a steroid. Think of a basketball player. I mean I’m a big basketball fan. We were in the middle of the playoffs right now. A basketball ten feet high think of it this way: Climate change is actually adding about a foot to the basketball floor so that more people can dunk the basketball. There’s just more amplification. That warmer and more moist climate is amplifying, as– as Heidi mentioned, some of the weather systems that we see. And one quick point I want to make. I often get the question: well, what is the big deal? One and a half degree? Well, if our child gets a one-and-a-half or a two-degree fever that may not sound like a lot, but our body responds to that and our climate system as well. But the scary news is we’re talking about an additional three- to ten-to-fourteen degrees perhaps in some models in the next one hundred years. JEFFREY KLUGER (TIME): And one of the problems is the problem is getting worse, as Doctor Shepherd says. We have now baked in another fifty parts per million of CO2 in the atmosphere. Even if we turned everything around now, what’s in the pipeline already is going to increase up to four fifty and at a rate of 5.4 billion tons of CO2, the U.S. puts into the atmosphere every year and 2.4 million pounds per second that the world pumps in. We’re getting a level of consensus on thousands of peer-reviewed studies over decades that have established the– the connection between human activity and this kind of climate change and we have to face the reality that the problem exists and now we have to address it. BOB SCHIEFFER: Well, what is the human activity then? JEFFREY KLUGER: Well, the human activity principally is fossil fuels. Now finally, everybody attribute this is to cars principally. Actually forty percent of all of the contribution is our homes, our office buildings and things of that nature. Fossil fuels do make a difference. And we are actually making progress, the slow transition to renewables, the increase in– in mileage standards for cars. All of this is bringing these numbers down, but all that’s doing is sort of putting out the fringes of the wildfire that’s blazing. We have to get to the heart of it and began to shut it down. BOB SCHIEFFER: And this is not just something that the United States that’s happening in the United States this is happening worldwide. HEIDI CULLEN: That’s what’s so tricky about this problem, right? It’s– it’s kind of the ultimate tragedy of the commons in the sense that we all contribute to the problem and so it– it really, you know, someone once said that climate change is really about a million little fixes and it’s also the biggest procrastination problem in the sense that the longer you wait to fix it, the tougher it gets to fix so the sooner we start the better off we are. DAVID BERNARD: And I really think adaptation is going to be the key. We’ve already baked in this CO2. We can’t get rid of that. So we have to learn to live with the way the climate is going and that means responsible development. We can’t keep building in the same places that maybe more prone to floods. I live in Miami Beach. We’re dealing with sea level rise. That’s something we’re going to have to think about going forward in this new reality. BOB SCHIEFFER: Doctor Shepherd, what– what I find kind of interesting is kind of like– it’s kind of like the country is divided in half. The western half of the country going through these droughts, which bring on the fires and all of that. Yet, on the eastern side of the country we have all these floods that are– that are going on right now. Is there any reason, scientific reason, that it’s kind of divided the country in half like this? J. MARSHALL SHEPHERD: Well, it– it is. One of the things that we’ve always known in the literature is that places that are drier likely will get more dry and places that are wetter will become more wet. If– you have to really look at how weather patterns occur weather patterns occur as big waves in the atmosphere. We call them scientifically raspy waves. And so if you look at a weather map, for example, on any given day in terms of weather you’ll have one part of the country that is cool and wet there and a big sort of dip in the wave pattern, a trough, as we call it. Meanwhile, you have– you’ll have a ridge of high pressure and nice weather in another part of the country. We’re– we’re it’s gorgeous here in Atlanta right now and I was watching the Braves and Mets last night in New York, pouring down rain and cool the last couple of days. That kind of take that sort of wave pattern and think about that from the perspective of climate. So you’re not going to have the same type of response everywhere. That’s why it’s important to keep that in mind when we hear “Well, gee, it’s really cold this last couple of weeks, what are you guys talking about, global warming?” You cannot say anything about the overall climate system by looking at the last couple of days or where you live. Boy, I wish I could actually predict my stock portfolio based on the stocks the last two weeks, the last two months. We can’t do that. We cannot do that with our climate. BOB SCHIEFFER: You know– and as is always the case around my house, we say when everything else goes wrong and top of it the toilet breaks. I mean, the least the– the thing you would least expect. In the middle of all this, Jeff, NOAA recently had one of its weather satellites go off line. What is the status of our technology? JEFFREY KLUGER: The status of our technology is precarious and funnily it’s easy to fix it. We have two major weather satellites hovering over the eastern half– half– East and West Coast, the GOES East and GOES West, they’re called. They’re in geosynchronous orbit. They just hover there. We have five polar satellites. These are all set to go down at one form or another, to wink out between 2015 and 2016. The earliest we can replace them will be those very years, which means that if there’s any lag at all in launching construction schedules we’re going to be struck blind. This we saw the wages of back during Sandy when the GOES East satellite did go down for a few weeks just as this storm was brewing and we did not predict the sharp left hook Sandy took into the Eastern Seaboard that is exactly what did the sixty-five billion dollars worth of damage. It took the European system to weigh in and inform us that this was about to happen. Now we had just enough assets in place, a spare satellite in orbit to swing into position and take care of this. But if we don’t take care of this now and allocate the necessary money we are going to be vulnerable to whatever is out there. BOB SCHIEFFER: I take you, you would endorse that? HEIDI CULLEN: I– you know, I couldn’t have said it better. Right now ninety percent of the data that goes into our weather models comes from satellites and this infrastructure it’s critical, it’s our eyes in the sky and if we lose it we’re flying blind. And we desperately, I mean, as a country that sees a lot of extreme weather across the board we need strong forward-looking forecasts. BOB SCHIEFFER: I’ll let you close it out here, Dave. What do we look for? DAVID BERNARD: Well, I think as we go through the next few months everybody needs to keep in mind that regardless of where our climate is heading in the next fifty, one hundred years, the hurricane season it’s here now and that’s hurricane preparedness week and as we saw it last year, everybody from Maine to Texas, you need to be ready, you need to have a plan. BOB SCHIEFFER: I guess we can’t say have a nice day to close out this segment, but thank you all for being here. We’ll be back in just a minute. So, basically, add additional heat to the atmosphere, suddenly, you’re now adding more moisture to the atmosphere, so we know that certain kinds of extreme events are going to happen more frequently. I don’t even need to look at long-term data to falsify this nonsense, just looking at seasonal variations is more than enough. If extreme weather events like tornadoes are more common due to more heat being in the atmosphere, then you’d expect more tornadoes when it is warmer, right? 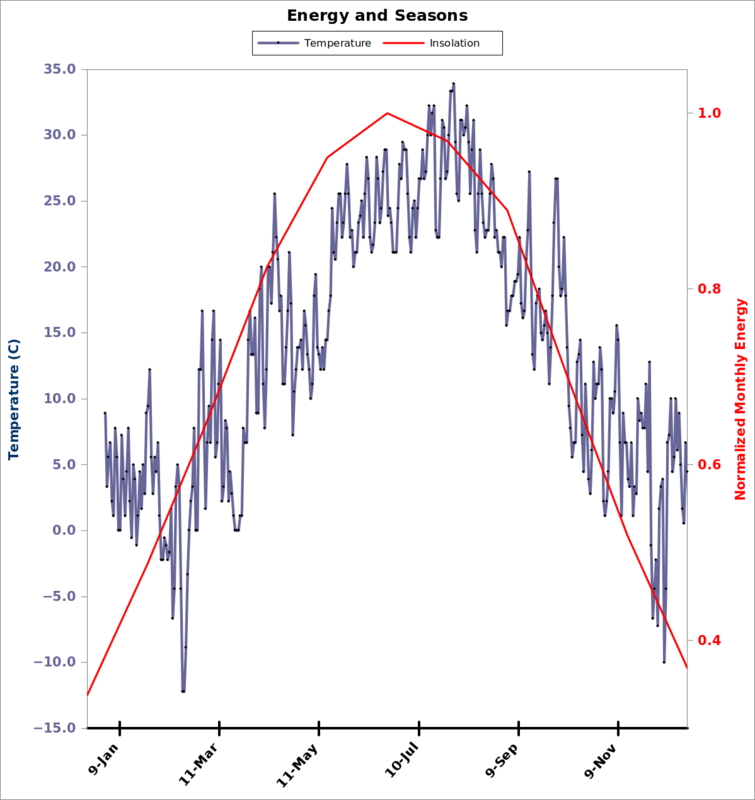 First let’s look at solar isolation versus temperature on a yearly basis in the northern hemisphere. Plotted below, from the middle of tornado alley is the daily temperature data for Manhattan, Kansas for the year 2006. 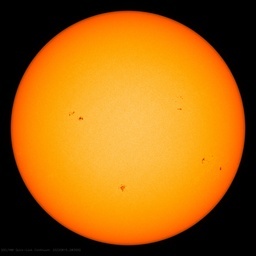 Compared to the normalized insolation from the sun. In the spring the temperature mostly lies beneath the energy. After the peak energy it tends to be above the energy curve due to the time lag. Graphic by John Kehr, The Inconvenient Skeptic. Note that peak temperature lags peak solar insolation. Solar insolation is a function of Earth’s orbit around the sun. Insolation peaks with the summer solstice, typically on June 21st each year, but temperature continues to rise after that. You can plot insolation vs temperature for just about any northern hemisphere city and see the same result, it is a well-known relationship. 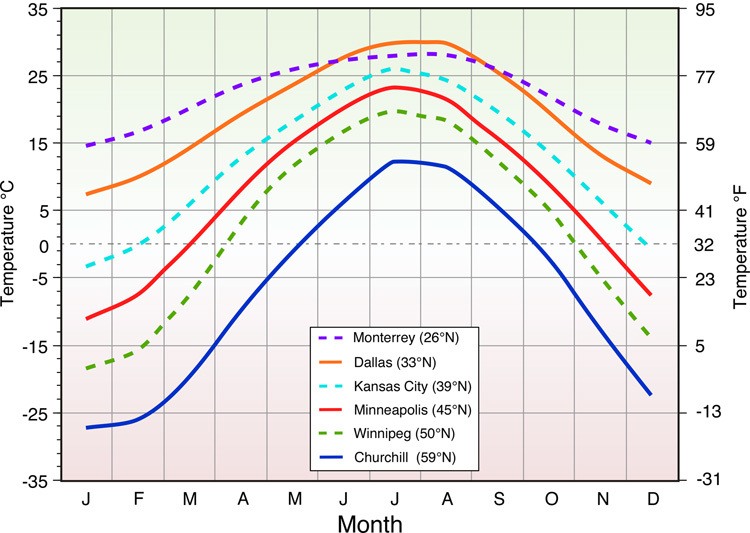 Temperatures peak around late July to early August. Latitude influence on mean monthly temperature. Mean monthly temperatures of five Northern Hemisphere locations with different latitudes. The graph suggests that monthly temperatures generally become higher as one moves toward the equator. Also, note that seasonal temperature variations between summer (June, July, and August) and winter (December, January, and February) become more extreme as latitude increases. (Image Copyright: Michael Pidwirny). 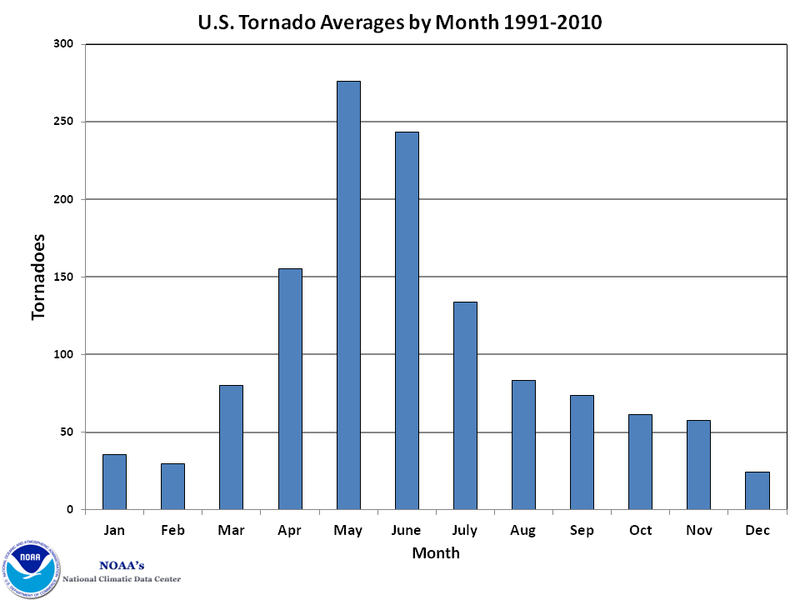 Tornadoes peak in May and June, prior to the peak temperature, which is a proxy for heat in the atmosphere. So if more heat in the atmosphere produces more localized extreme weather events, as Dr. Cullen insinuates, we’d see peak tornadoes aligned with peak temperature. But, we don’t. Dr. Cullen is being an advocate, rather than a scientist, but we already knew that since she works for a privately funded advocate organization, Climate Central. 5. Climate change is producing tornadoes of increasing frequency and intensity. There have always been F5 tornadoes, and we will continue to experience them regardless of whether the Earth’s temperature rises or falls. National Weather Service figures show, if anything, that violent tornadoes — F3 or greater on the Fujita scale — are becoming less frequent. There is no trend, neither up nor down, in the frequency of all tornadoes. To be fair, she said “certain kinds of extreme events” will happen more frequently, not tornadoes. So, you think that you are being fair by pointing out that she offered total vagueness rather than the falsifiable hypothesis that Anthony identified? LOL! They sound like politicians desperately trying to infer things without saying anything that can be thrown back in their faces later. Pathetic twerps. Having grown to maturity (1948-1966) in Tornado Alley, NW Alabama, and being unable to forget my mother’s hysterical recollections of the several times that Tupelo MS was “blown away,” I can assure you that the big tornadoes have not increased in number or ferocity. The damage that they cause has increased greatly because wealth and population have increased greatly. I earned my knowledge of tornadoes. I spent about 1600 hours, total over 18 years, in a storm cellar. I spent about 16,000 hours under threat of a trip to a storm cellar. I can do a verbatim repetition of what was broadcast on the radio on the several occasions that Tupelo “blew away.” See my reference to my Mom above. Although there are probably very few people out there who rate the overall intelligence of the climate alarmist community more poorly than I do, even I cannot continue to credit this continuing deluge of PR doom mongering to simply ignorance and or incompetence. As you have pointed out Anthony these ideas are false at almost the intuitively obvious level and they have been obliterated not just here and in the other skeptical blogosphere and literature, but by the very organizations that the alarmist community tell us are the paragons of “consensus” climate science. Given that, the only logical assumption that seems tenable is that this ongoing effort is not attributable to simple stupidity, but can only be explained as a malicious and mendacious attempt to deliberately deceive the low information public, the existence of which is the legacy of allowing, over several decades now, our public education system to be transformed into a public indoctrination system. A system where the goal of teaching and developing the capacity for rational thought has been almost entirely replaced by a goal of raising revolutionary consciousness and programming the little skulls full of mush to believe that what they feel is infinitely more important than what they think, to the point where rational thought is not only impossible for most of them, but is actually anathema. Unadorned, ugly scare-mongering from an official of the AMS – said in the course of a Red Herring Fallacy (the models). Hmmm… I count six, not five, locations. But it’s a minor quibble; the point is clear. Which kind of “extreme events ” would those be? From what I’ve seen if there is any trend in the rate of any of the supposed “extreme events” i.e. tornadoes, hurricanes, cyclones, droughts floods, etc., it is either flat or negative. Very well said. Yes, the educational system that came out of the Enlightenment has been replaced by a system of indoctrination that supports societal tribalism. What we see in the interview above is the Global Warming/…/Extreme Weather tribe expressing its fundamental beliefs in a language so unscientific, “personality,” that only professional folklorists could understand it. “Tornadoes peak in May and June, prior to the peak temperature, which is a proxy for heat in the atmosphere. Hurricane season for the northern hemisphere peaks out around September 10th. Why does it not peak in May or June like tornadoes do? Or in July? Why the lag? Nothing is more enlightening than a mono-tribe among sock-puppets. > In the Spring, I have counted 136 different kinds of weather inside of 24 hours. And that was just one visit to New England! Twain would have loved this holiday – Rain much of the day yesterday, part of several days that brought me 2.75″ (and other places much more). Snow last night, but not to me here. 500 feet higher probably. Certainly northwest at my yurt on the flank of Mt Cardigan. More than 4″ from a CoCoRaHS spotter in VT. The sun returns tomorrow (yay) after a frosty start. The high yesterday was 47°F, Thursday should be in the 80s. The changes aren’t as extreme as in mid-continent, but they are more variable. Weather now has personality, heh? Clearly that cast panel hasn’t read my accounts here of the “Witch of November” that hit Armistice Day 1940, The Great Atlantic Storm of 1962, or the Blizzards of 1978 (January for the midwest, February for the northeast). We still talk about ours. And this year we’ve reminisced about the big snow storm in May 1977. That was when weather had personality. The two graphs raise an interesting question: the “scary” graph shows (I think) an instantaneous moment reflecting (perhaps) some time during the development (maybe) of the EF5 tornado. The second graph shows the temperature deviation on average from 01-01-2013 to (perhaps) today or very close to the day of the EF5 event. Neither is necessarily pertinent to the EF5 (and I don’t think it does: it was the rotational movement of signficant air masses that lead to the the tornado at that time in that place), and neither is necessarily pertinent to CAGW worries. Still, the two together say something very, very pertinent to the AGW discussion. They say that over differing time intervals we have differing views of a deviation from “normal” (whatever, as the commercial goes, your normal is). 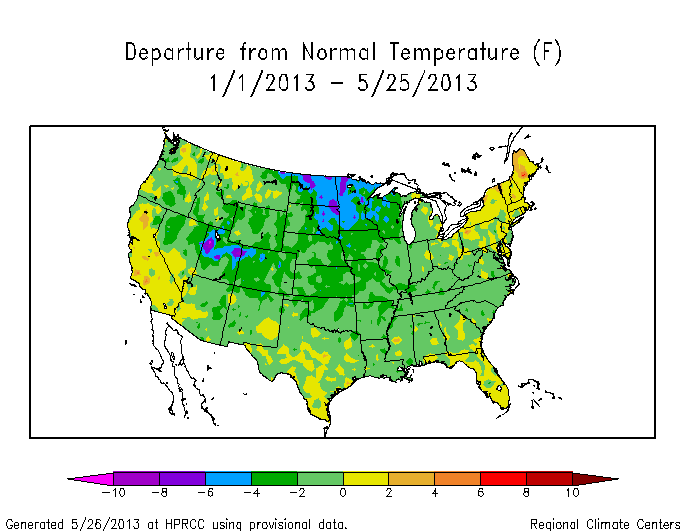 Let us keep that concept in mind: in climatalogy, what is “normal”, really? We have been saying that 30 years is “normal”, by which we mean that all processes that vary, vary in a random enough way that over a 30 year period they have averaged out. Only longer-term processes that act on the entire system remain. Is that so. Or is that assumed? On what basis do we assume that all processes “random out” within 30 years? Over the last 10,000 years, we have seen numerous rises and falls, including the MWP and the LIA. No smoking gun has ever been found for these rises and falls, but some unique, powerful process is ASSUMED to be responsible. Is it possible that, instead, the variability of “normal” processes do not random out over 30 years but over 1000 years? That the LIA was not a sudden shut down of the sun but the combination of several smaller, normal variations (ocean currents, consequence cloud development, wind patterns) that, together, dropped temperatures until another, normal combination of varying processes, brought us out of it? I have been told (but not seen) of colour variations in internal structures of old sand dunes in North Africa and the United States. I have seen banding in glacial ice in Canada, and in the satellite photos of polar ice on Mars. For sand dunes to have different colour bands, you have to have different source areas, which means sustained, significant changes in wind direction. Glacial banding here and on Mars is taken to represent differential AMOUNTS of deposition, removal and movement, but perhaps different directions are also at work. Longterm, cyclic changes in the character of weather patterns – such as we are seeing in the post LIA times. All this comes back to the question as to what is “normal”, or what we determine is the reference period. The weather channel shows (probably) a specific moment in time and how that is different from some protracted period of time, unstated. The WUWT figure shows the difference of a near 6-month period to some other period (presumably the prior 30-year period). Neither is necessarily pertinent to the EF5 subject in discussion, but both show how “this” moment may be completely different from some other moment. Yet before we can know what signficance this hold, we have to know what the variation is that is “normal”. So with the time in which we live. On what basis do we say that the hundred year period is actually randomed out? I recall that it was said to take 300 years to travel from the bottom of the ocean from Europe to America; I don’t know how true this is (and it doesn’t matter) but the principle is interesting. If oceanic processes “random out” in a 600 year period, then we are deeply wrong to think we can attribute any 30 year change to one item (CO2) without understanding what other temperature influencing cycles are at play. CAGW is just speculation, responding to CAGW Scenarios is about certainty of outcome (not possible outcomes, but certainty that one of the terrible ones will, not may, occur). If we cannot say with a high certainty that we understand at what point natural factors average out, we cannot say with a high certainty that the last 30 years of warming (+ pause) is anything we had to do with or can do about. The weather is now a political scapegoat.. If our weather / climate was a person, what they are doing would be a hate crime..
Kinda funny seeing the same old method of operation for political power being used on the weather.. The most useless bizarre crop of morons that have ever attempted to lead anybody anywhere..
More windmills and solar panels because we dont have a clue what we are talking about.. Lets pretend we are right because otherwise we are wrong.. The means justifies the end.. Even though everything has turned against them.. The weather, climate, economy and the science, they still have doe eyed followers needing their hands held into the next election.. So its the wink wink nudge nudge fill in the blanks feel good news to keep up moral..
Feel good meaning we are all still doomed.. Your special and dont forget to vote on election day..
LOL. Either the person writing the article made a mistake or Shepherd hasn’t a clue about basic meteorology. They are called Rossby Waves. Looking at the top map of the U.S. . Could someone Define for me how much in Degrees C the scientific notation of Severe is? Is is 0.5C? 1.5C? 3C? Is that average daily temp, Max high temp? Every response to these growing loons that does not include the demonstration that they act so because the thermometers are not cooperating with their fears, just becomes part of the gabfest. It’s a wash.
Every response that has evidences some knee jerk generic response about environmentalism or the EPA, is a win for them. Every time they move you away from the thermometers without you bringing back focus to the thermometers, is a win for them. They are not ready to pretend “climate change” was never really about increased man-made heat. They might like to slide into that, but it should be stuck in their faces…if you want to win argument points. I think what we see though the fact that we crossed four hundred parts per million of CO2 in the atmosphere just last week. This is the highest it’s been since the Pleistocene era when there were forests in Greenland and sea levels were sixty feet higher than they are now. As recently as 1958, it was only three hundred and fifteen. Why do we not see the same conditions in Greenland or sea levels 60 feet higher now if CO2 is such an influential controller of weather/climate? As noted by others, were there no extreme weather events prior to 1958? Should it be possible to reduce CO2 to whatever level these people think will provide an Earthly paradise, can we sue/tar & feather/place them in stocks whenever there is an extreme weather event? This is more encouragement for me to wear my “I survived…” t-shirt. Yes a few billion here, a few billion there and pretty soon you’re looking at serious money! Personally, I suspect the answer is probably about double the length of the current CAGW era because, from what I’ve seen, most of the “science” that is monopolizing current funding is actually retarding our understanding, not advancing it. If all the grant money squandered on hyping the “pollutant” CO2 had been invested in expanding our understanding of the real 800 pound gorillas of the climate i.e. the Sun and H2O I don’t know that we’d have achieved real understanding of our climate, but I’m almost certain we would be one Hell of a lot closer than we are at this point. The 1999 killer was #6, followed by tornadoes in 1942, 1893, 1930 & 1882, to round out the Top Ten most lethal OK twisters. The 2013 Moore tornado killed 24 people (so far), moving it into ninth place, but the cool 1940s remain the worst decade, by far. There was one Top Ten in the hot 1990s & none in the 2000s. Actual numbers don’t matter to CAGW adherents. I stopped reading at “Heidi Cullen”…. It’s the (precautionary) principle of the thing. What caused this (from Wiki – my bold)? It is unseasonally cold here in Germany, I would say 5 degrees C less than usual at this time of year. If my kid had a body temperature of 32 deg C I would be pretty worried. And I don’t even have to wait a hundred years. Wait, Cullen says in a hundred years it’ll be back to normal? Now that’s good. So many things, so terribly backwards, I hardly know where to start. The Mother In Law recently died at about 85? Something like that. She grew up in Oklahoma. One of her stories was about a giant tornado that came through when she was about 4 or 5 years old. It picked her up and carried her about 100 yards, then plopped her on the ground. (They were, luckily, only on the edge of it…) It caused horrid destruction for miles, including their home, but they picked themselves back up and carried on. So take 2013-85 and I get about 1928. I do remember her saying it was about the time of the Great Depression too (and don’t forget The Dust Bowl). In her opinion prior to her demise she said that Oklahoma had gotten a whole lot nicer since then. That things were LESS extreme, and that the ’20s and ’30s had been worse. Her family grew up in California, as, after W.W.II, they moved out here. Anyone remember The Grapes Of Wrath? The vast convoys of “climate refugees” flooding out of Oklahoma and nearby States and into California? Escaping the horrific drought and The Dust Bowl? Where clouds of dust so thick you could not see the sun blew all the way to Chicago and even the East Coast? How about the Labor Day Hurricane in the Keys? IMHO, all we have here is normal cyclical weather. It got warmer a little bit in the ’80s and ’90s (after a significant cold turn in the ’60s and ’70s when it snowed in my home town in the Central Valley of California – a place it practically never snows…) and during that warm spell, things quieted down. (Yes, Virginia, the “bad weather” gets damped by hot cycles… when the ‘cold pole’ of the heat engine warms up, the engine slows down…) Now we have simply started a return to the prior cooler status, and that gives a more normal weather pattern. I’m only 60, so have only barely seen one whole PDO cycle. Yet I have a pretty decent memory. Right now, the winds are more “blustery”. Almost exactly like they were in the ’50s when I was a kid. I’d noticed them become more soft and subdued. In the ’60s and early ’70s there was a big scare on about “Clear Air Turbulence” for aviation (and a fair number of crashes). Then that just kind of went away. The turbulence dropped (on average). At the latest cold turn / solar funk, the atmospheric height shortened, and the “blustery” came back to the winds as it was 60 years ago. At about the same time we had 2 major airplane crashes after a couple of years of not one. Turbulence and a plugged pitot tube in one case. So from my perspective on climate, all that’s happened is a turn of the cycle back to the cooling 1/2 wave. That has deeper Rossby Waves (as I remember seeing illustrated on my B&W TV in the early ’60s when weathermen did real weather charts on camera, live) and more wind driven weather. I remember when those deep waves moderated (on average) in the late ’60s to early ’70s and the talk was all about that “flat jet stream”. My Mum made a return visit to England then. Her flight (a 707 IIRC) made a record of it. Something like 9 hours from SFO to England. They were able to sit in the Jet Stream the whole way and arrived at a refueling in Iceland or Greenland or some such way early and had to wake up the crew. (It’s a bit hazy as I was a kid then and not that interested in just which country they were in; just that they had to wake up some guy to get gas a few hours early). So I’ve seen, and observed, this whole cycle. Not a single thing is different now, in terms of hurricanes, tornadoes, drought, wind, storms. Nothing. Yes, we had a different pattern for a couple of decades in the ’60s and ’70s cold. I asked the local “old folks” about it. They thought back and said “no, not new… like it was back in…” and cited some date in the late 1800s to early 1900s. They were in their 70s and 80s and that was ’63 or so. So they were remembering “when they were my age” in the late 1800s. And that was one of my very first introductions to the cyclical nature of weather. We had a restaurant in a farm town with folks from many parts of the country who had moved to California. They liked talking to “the kids”. I listened. What I learned was that the “Old Folks” had seen it all before. And that they had seen a whole cycle. That the younger folks had only seen parts of cycles, so thought this was “new” or “different”. But it isn’t. I asked my Dad about heat during the “hot times”. He pointed out that nothing came close to the 1930s. IMHO, still doesn’t. Almost, but not quite. Similarly I asked my wife’s Dad. He, too, said it was nice weather now, not as cold as before, but not as hot as the ’30s; and that this was some of the best weather of his lifetime. Not too cold or too hot. (He passed away about a decade back – so we’ve not warmed since as it was about 5 years into the ‘flat not warming’ tail). All this, IMHO, simply points out that these folks on the TV are not able to see beyond their own short life spans, were not paying attention to The Old Folks when they were kids; and now have an ambulance to chase. FWIW, we are now in the start of a “cold cycle”. The poles are cooling (that’s where the net heat leaves) and that cools the “cold pole” of the heat engine. The oceans hold a lot of heat, so for the next decade or so it will be leaving. That will involve a lot of water evaporation from the oceans (falling as rain and snow as in the UK and Australia recently) as the oceans cool. In about 20 years the oceans will have cooled and overall things will be colder and snowy. Then the tendency to storms will fade and the “Loopy Jet Stream” will once again flatten. Then we will take another 1/2 cycle of the next 30 years after that as things “warm” again. It’s 30 years of cooling, then 30 years of warming, then 30 years of cooling again… Folks over 60 have seen it (though some didn’t pay attention) and the “Climate Scientists” are trying to exploit it for gain and influence (or are dupes). For them to attempt to fear monger like that is just offensive. I was old with grey hair when the Blather began. Now this old child has no hair! You belie your name. Far from being clever, you are ignorant of climate history & incapable of reasoning cogently therefrom. You mean the Pliocene. But your statement (corrected) shows that CO2 clearly is not a major driver of climate change. The reason that forests haven’t returned to the Canadian Arctic nor the Greenland Ice Sheet melted is that carbon dioxide concentrations have little effect on global average temperature. What caused the Pleistocene glaciations was the formation of the Isthmus of Panama, interrupting oceanic circulation, & other natural events, such as orbital mechanics. CO2 fell as a result of a colder climate. Similarly, the Antarctic Ice Sheets formed in the Oligocene Epoch when that continent was cut off from Australia & South America by the formation of deep channels in the Southern Ocean. Again, the climate cooled & the oceans absorbed more carbon dioxide from the atmosphere. Thanks to CBS for providing a chart without scale. Ah…that map shows only the USofA.Since when is 2% of the land in the world global?? Oh.And we here in Alberta just had a “severe” wx event.It rained!! Thank God.It helped put out the other “severe” event….wild fires,caused by cAGW drought. The damage that they cause has increased greatly because wealth and population have increased greatly. Exactly, this is the part progressives have the biggest issue getting over. They are not doing enough to redistribute the wealth, otherwise these red states would have less to loose. 1. The “Tri-State Tornado” killed 695 people and injured 2,027, traveling more than 300 miles through Missouri, Illinois and Indiana on March 18, 1925. It was rated an F5 at the top of the old Fujita scale (with winds of 260-plus mph). 2. The “Natchez Tornado” killed 317 people and injured 109 on May 6, 1840, along the Mississippi River in Louisiana and Mississippi. The official death toll may not have included slaves, according to the Federal Emergency Management Agency. 3. The “St. Louis Tornado” killed 255 people and injured 1,000 on May 27, 1896, in Missouri and Illinois. It had winds of between 207 mph and 260 mph. 4. The “Tupelo Tornado” killed 216 people and injured 700 on April 5, 1936, in the northeastern Mississippi city. 5. The “Gainesville Tornado” was a pair of storms that converged April 6, 1936, in Gainesville, Georgia, killing 203 people and injuring 1,600. The tornado destroyed four blocks and 750 houses in the northern Georgia town. 6. The “Woodward Tornado” wreaked havoc across parts of Texas, Oklahoma and Kansas on April 9, 1947. The storm, which killed 181 people and injured 970, reportedly was more than a mile wide in places (previously cited as worst OK tornado). 8. The “Amite/Pine/Purvis Tornado” killed 143 people and injured 770 on April 24, 1908. The storm left only seven houses intact in Purvis, Mississippi, and also caused damage in Amite, Louisiana. 9. The “New Richmond Tornado” killed 117 people and injured 200 on June 12, 1899, in New Richmond, Wisconsin. 10. The “Flint Tornado” killed 115 people and injured 844 on June 8, 1953, in Flint, Michigan. The tornado was the deadliest twister ever recorded in the state. Numbers four & five were back to back in 1936. Only other decade with two among the Top Ten was the 1890s. None occurred in the allegedly hot decades of the 1990s & 2000s, nor the cooler 1960s, 1970s or 1980s, but, presumably with less population (generally; OK lost from 1930-50), the 1890s, 1900s, 1920s, 1930s, 1940s & 1950s suffered individual disasters killing over 100 to hundreds of people. The CAGW bletheren look at themselves. and in comparison, a dead newt would have more character. !! These liars are hoping we mere sheeples don’t have a memory that spans back 20 years or they’ll be caught out. Unfortunately, it appears to be true. Everything people learned in science class has been erased by this scam. The majority of humans don’t appear smart enough to question such ridiculous claims of the CAGWist front. Frog rain has been reported on since Pliny The Elder, caused by waterspouts sucking them up. But, what do facts matter to them, when they are trying to give weather “personality”? I had to force myself to read that echo-chamber of doom crap. Sickening. Now that the GHG climate sensitivity has been cut by 33% to 50%, we can start to embrace the beneficial impact higher CO2 will have for C3 plant productivity. The doom-mongers can’t really be against increased plant productivity can they? The issue can almost shift now to how much CO2 do we want in the atmosphere to maximize the biome’s productivity. It will be good for everything (even weeds in your grass which might allow some communities to bring back 2,4-D). See how things could change with just a subtle change in a person’s viewpoint. The weather now has so much personality they give it personal names. Coast ventures to the furthest flung reaches of the British Isles. Nick Crane tells the astonishing tale of the Great Storm of 1703. My respect for the news media went out the window YEARS ago. Sorry, but most of what I’m hearing from the is rehashed propaganda. However, the internet has proven to still be an open channel for a wide range of information. Guess we should liken the personality of climate with this new and improved pain chart. That’s the one that traumatized my mother. The radio broadcasts were begging for physicians to go to Tupelo. Some physicians drove from my home town, about 75 miles. To put this in perspective, injuries to 700 people would mean that just about everyone in the “metro area,” so to speak, was injured. There were other occasions on which Tupelo was “blown away.” The next biggest was 1953, or so I believe. Fortunately, the tornadoes did not kill Elvis’ parents. Thanks for posting this information, milodonharlani. I believe this is end of days stuff for the true believers of the cause. The sport of hysterics, wetting oneself over the weather. This pastime has a history as old as spoken language, we in the English speaking sphere know it thro the tale of Chicken Little and if we had educated our children they would recognize the cures as synonymous with the Emperors new clothes. I am encouraged by the knowledge that human nature has changed very little, once the conned become cognizant of the con artists, entertaining times will be had by all. We really need Josh on this one. Josh can show us the variety of personalities that “extreme weather climate whatever” can have. I want to see the Jekyl-Hyde version. Anthony can sell cups. These cups should sell big time. And just think, they come with the AMS stamp of approval. Very well said. Their medical analogies always fail. I guess they haven’t a clue about medicine. Or maybe not a clue about analogies. I saw this CBS segment, and it made my hair stand on end. MSM still doesn’t get it!!! What drivel. Bob Schieffer should be thoroughly ashamed of himself (except that shame is not an emotion experienced by leftist ideologues, so don’t anyone hold their breath on it). Probably a transcriber’s error; these are common in transcripts. CBS organized this… Just as if CTV Globemedia was assembling a panel with Homer-Dixon, Liz May and David Suzuki… It is called information but in fact it is advertisement. You’re welcome. What’s disturbing is that, although tornadoes tend to hit the same areas, including Moore more than once, the community still lacked safe rooms or other wind-proof shelter. Maybe better forecasting & alarm systems have saved lives in recent decades, but this may have been offset by flimsier housing. Surely lots of ramshackle shacks existed in the first half of the last century, but at least they used nails instead of staples to attach roofs, & the less said about “manufactured homes”, the better. Tornadoes result from a contrast between cold and warm air masses and their movements. The common occurrence of this is in the USA in May and June. It is the temperature contrast that is important. Hurricanes (also called tropical cyclones) do not form in the same manner as tornadoes nor in the same places. One of the key requirements for hurricane development (among several) is for warm water in the Atlantic Ocean 300-500 miles +/- north of the Equator (see tropics and Coriolis) and heating time is needed, thus the lag. Same with a pot of cold water – heated slowly on a stove there is a lag before if boils. The above is deliberately short. If it is not enough to help, please ask specific questions. Thanks. BOB SCHIEFFER: Doctor Cullen, there’s no question that it’s getting warmer. We have a graphic here that just shows 2012 was the hottest year on record. In the U.S. You can bet that qualifier wouldn’t have been left out if he were talking about a cold record somewhere. A month ago on NPR’s humorous weekend show, “Wait, Wait, Don’t Tell Me,” the same tactical omission was made by the show’s host. I complained to the show by e-mail and received an irrelevant canned response about how I mustn’t be over-sensitive to things that offend me there, because after all it is a satirical show. HEIDI CULLEN (Climate Central): It’s not going to get any better if we don’t do anything about it. So if things get cooler, that claim will be falsified. What will she say then? “Never mind”? I mean right now we’ve added about a degree and a half of extra warming to our atmosphere, the planet is that much warmer. Since 1900. But “we” have only been adding significant CO2 since 1950, since when the climate has only warmed by half the amount she mentioned. What a phony. Does she realize the sort of impression she’s making? So, J. MARSHALL SHEPHERD (American Meteorological Society/University of Georgia) informs us that, “…weather is your mood and climate is your personality…” So is he a weather psychiatrist? Psychoanalyst? Clinical social worker? Does he help the atmosphere deal with its feelings? Explore its motivations? Does he give the atmosphere relationship advice? Could CO2 be a psychotropic weather drug? Or is he merely feeding us a bunch of crap? Good points. Because the topic is very sensitive, I will be hyper-cautious. You might check on the Phil Campbell, Alabama tornado of one or two years ago. And the same holds for the Tuscaloosa storm on the same day. The MSM video shows wreckage of relatively inexpensive frame houses. There is a community college in Phil Campbell and it is built of brick. My guess is that it was not destroyed. The MSM never shows the contrasts. Given disaster, they always show greatest possible amount of rubble. When I was living in Tornado Alley, everyone who owned their house had a storm cellar. Recall that this is farm country. Usually, the storm cellar is a structure that is buried in a small hill very near the house. The country is very hilly. The storm cellars were impregnable. Builders who create track housing are likely too cheap to create a cellar under the house. Track housing is built on ground that has been leveled. So, people who live in typical track housing are deprived of the storm cellars that are common among farmers. In the late ’90s after having lived in Japan, through briefly, I stopped watching the ‘National’ and Cable broadcast ‘News’ here in the U.S.A. Briefly, in September 2001, I returned the the ‘National’ broadcast ‘News’ programs and it was brief. To this day while I do not have a ‘digital broadcast signal provider’ i.e. ‘TV’ and I refrain from the U.S.A. ABC, CBS and NBC triumphant on the World Wide Web, for good reason. But we (Americans) are doing something about it–our CO2 emissions have declined significantly over the past five years or so. Why wasn’t that chart shown? … What’s disturbing is that, although tornadoes tend to hit the same areas, including Moore more than once, the community still lacked safe rooms or other wind-proof shelter. On the 2nd point about shelters: Wow. A rather broad, all encompassing statement probably supported by little in the way of direct knowledge, field survey work or polling even (I could be wrong on any of, or all of those points). And so, given your above statement, you are a proponent of what exactly? From an engineering point of view perhaps a reasonable amount of reinforcement of the concrete-block wall construction (to keep them erect a little longer in the face of winds, and other forces) in commercial (school) structures might be called for (more of the school -and the ppl/kids- might have survived). It’s simple, but costly to implement ‘community safe rooms’ in every building. See also Item (1) ref the percent of homes in Moore which had safe rooms/shelters. NOT everybody views that as cost effective. Given the high survival rate, maybe refinement is needed to identify and quantify what exactly resulted in the loss of life (e.g. direct exposure to the tornado winds/debris, pinned under rubble, electrocuted by downed power lines, drowned, etc), rather than choosing the ‘nuke’ solution of putting everyone in Moore and OKC underground for their own protection. If you are offering to author or sponsor a study to find out what could have save that last 0.05% of lives that would seem to be first step in the right direction vs a blanket prescription (otherwise we might should be engaged in many more ‘preventive activities’ along the lines of applying the ‘precautionary principle’ to ‘save lives’). “MOORE, Okla. — Ten children are dead, and Mayor Glenn Lewis wants tornado shelters in all new homes built in Moore. A proposed ordi­nance would require a shelter either inside or outside each new residence. About 10 percent of Moore’s homes had safe rooms or shelters before the storm, said the city’s emergency management director, Gayland Kitch, during an interview earlier this spring. Many good insightful comments here. Mine is strictly emotional. Reading a transcript is revealing because it makes mere babbling stand out in stark clarity. People often babble when they’re lying or don’t know what they’re talking about. I feel resentful when people get paid good money for doing that. HEIDI CULLEN: So, basically, add additional heat to the atmosphere, suddenly, you’re now adding more moisture to the atmosphere, so we know that certain kinds of extreme events are going to happen more frequently. But is there more humidity? I thought that there isn’t, at least at the layer of the atmosphere where the models said it would have an effect. JEFFREY KLUGER (TIME): We’re getting a level of consensus on thousands of peer-reviewed studies over decades that have established the– the connection between human activity and this kind of climate change. Tornadoes result from a contrast between cold and warm air masses and their movements. Let’s get real John, it takes more than just that! Tom More of MA you don’t understand Joe Olson of http://fauxscience.com. You need to spend a week digesting the thought processes of a pure engineering genius. Luther Wu you environmental folks are actually worried about raptors while your rotating bird shredders have been destroying 500K birds to date. Looked in the mirror Luther– a trace gas necessary for life is not the culprit–you and your ilk are. BOBJOB: What in the world does that mean? WFM: Well, BJ, it means that if all things are considered, we, meaning us, have a 50% chance of sliding into a ~100kyr long ice age, just like 7 of the last 8 interglacials did. BOBJOB: Now that just doesn’t make any sense! How could you possibly come up with a 50% chance in 1 out of 8? WFM: Because it’s actually worse than you think BJ. Three of the last 8 interglacials, like this one, occurred at an eccentricity minimum. One lasted about half a precession cycle, and the other didn’t, it went long. The question is will this one go long or is it just about kaput? BOBJOB: Well, which is it? WFM: Again, it may be worse than you think, BJ. Nobody can really say with any degree of confidence. If CO2 is a BJ, then at best we have a 50% chance of delaying or maybe even denying onset of the next ice age. If CO2 isn’t a BJ, then, well, it’s 1 chance in 8 that the next ice age is just around the corner. BOBJOB: But what about all the warming, surely you don’t deny all the warming, do you? WFM: That depends, BJ. If you are referring to the warming that is obvious from the last time the PDO/AMDO went positive, in the late 1970’s, then no, I don’t deny that warming. If you mean the warming obvious in the manufactured data since just before the turn of the last century, or that entire century, no, I do not deny that either. In reality, BJ, one of the most effective BJ’s of all time is the anthropogenic global warming we have manufactured into the global data sets our very selves. On the other anthropogenic hand, the ends of the extreme interglacials, extended somehow or not, we tend to find from 1 to 3 strong thermal pulses right at their very ends. BOBJOB: Well, how in the world would we be able to tell the difference? WFM: With apparent difficulty. You see BJ, one of the biggest unrecognized anthropogenic BJ’s there is, is just how unprecedented our BJ effects are supposed to be! If we take the most recent Gold Standard of climate science, the IPCC’s Assessment Report 4 (aka AR4), sea levels could rise to +0.59 meters above present mean sea level by 2100. That is so large it is almost unmeasurable against the sea level highstand which actually did occur at the end of the last interglacial, which was somewhere between 10 times larger to almost 100 times larger than the IPCC’s best guess. With the anthropogenic “signal” coming in somewhere between ~1% to at best about ~10% of what tends to happen anyway, it’s going to take some fancy digital signal processing to say which BJ is ours and what BJ might occur anyway. BOBJOB: So, in essence, what you are saying is all the hoopla about global warming is just so much hot air, right? WFM: Yes, BJ, I’m saying that in respect to things climate, at ostensibly an end extreme interglacial, anthropogenic global warming might not even be a noticeable BJ. The feeling I am getting at various general websites is that people are fed up with this kind of alarmism. The more these lies are stated while the general population is experiencing cooler than normal conditions, the lower their credibility. These people are making caricatures of themselves. I’d call this another own goal. The average person is starting to wise up. Good criticism of Heidi. The humidity levels are not higher. No actual Scientist could use those words: “add additional heat” in any context unless they are talking about a cooking recipe or bunsen burner experiment. If CO2 could “add additional heat” to anything we could rewrite conservation of energy laws and start using CO2 in home heating. Heck, we could have CO2 winter parkas and socks and gloves and etc. If Heidi Cullen had an IQ above a valley girl she would have said CO2 ‘can delay the cooling of the sun-supplied heat’ in the atmosphere. With emphasis on delay because you can’t create more sun-supplied energy, you can only process what it sends us. Heidi Cullen has to be among the dumbest people on Planet Earth. She has proven impenetrable to facts and even common sense. Heidi Cullen is an agenda driven activist and has no business being vaguely associated with Science. She should be editor for Omni magazine in the late 1970’s. J. MARSHALL SHEPHERD (American Meteorological Society): … we now have a steroid. Think of a basketball player. I mean I’m a big basketball fan. We were in the middle of the playoffs right now. A basketball ten feet high think of it this way: Climate change is actually adding about a foot to the basketball floor so that more people can dunk the basketball. There’s just more amplification. Completely stuck on stupid. There is no other way to describe these people. Here is what they are saying without ever really saying the exact words: ‘The CO2 levels of the Little Ice Age (and all the previous time periods!) are what we really need today. Period. We need those CO2 levels of the Little Ice Age (and all the previous time periods!) so that today’s weather will be as static and consistent and predictable as the climate during the Little Ice Age (and all the previous time periods!). Period.’ Now if those CO2 levels of the Little Ice Age (and all the previous time periods!) were as constant and unchanging as they say, how can they possibly account for all the dramatic climate swings that occurred during those times? So we can further state that what they are really saying is this: ‘We need those CO2 levels of the Little Ice Age (and all the previous time periods!) so that today’s climate will be allowed to have dramatic swings similar to the shifts from Medieval Warm Period to Little Ice Age without any possible interferrence from human beings. Period.’ In a real sense they are religious cult worshipping a deity over human beings, their deity being a hypothetically unspoiled mother nature free to throw angry climate changes at the planet at her leisure. They are right on the cusp of being a full-out Jonestown death cult distributing cyanide to their fellow worshippers. In fact these despicable vermin already have blood on their hands. Finally something uttered by the AGW cult that I can fully agree with. …this may have been offset by flimsier housing. Surely lots of ramshackle shacks existed in the first half of the last century, but at least they used nails instead of staples to attach roofs, & the less said about “manufactured homes”, the better. The absence of steel reinforcement in concrete block masonry makes such a system vulnerable to lateral wind loads. Even load-bearing block masonry walls have often collapsed owing to the lack of steel reinforcement and cell grouting. Examples of such failures have been shown by Sparks et al. and Hogan and Karwoski  in both tornado and hurricane damage. Bond beams atop masonry walls have performed poorly in past windstorms. McDonald and Marshall  had attributed the failure of an entire roof system to a failed bond beam system on a masonry structure. Failure initiated as the mortar joint below the bond beam failed in tension. Now, a direct hit by an EF4 or 5 tornado may decimate a house properly built according to recommendations, but, house survival at the periphery of such a tornado or in lesser tornadoes becomes a possibility rather than just another ‘damage statistic’. In other words, they are howling in full activist mode – maybe turbo. The end is near. JEFFREY KLUGER (TIME): We’re getting a level of consensus on thousands of peer-reviewed studies over decades that have established the– the connection between human activity and this kind of climate change and we have to face the reality that the problem exists and now we have to address it. JEFFREY KLUGER: Well, the human activity principally is fossil fuels. Now finally, everybody attribute this is to cars principally. Actually forty percent of all of the contribution is our homes, our office buildings and things of that nature. Fossil fuels do make a difference. And we are actually making progress, the slow transition to renewables, the increase in– in mileage standards for cars. And the slow transition to natural gas–funny he skipped that one. All of this is bringing these numbers down, but all that’s doing is sort of putting out the fringes of the wildfire that’s blazing. We have to get to the heart of it and began to shut it down. Only a transition to nuclear will work. I guess you missed this: The above is deliberately short. I was unsure if ‘Jack Hydrazine’ was just passing through or whether he was asking a question seriously and should be answered. Why not read Jack’s comment at 1:40 pm and then provide the answer you feel it deserves. Thanks. In the places where I live, tornadoes are rare, but earthquakes, cyclones & other severe windstorms frequent. I know how tornadoes differ from hurricanes, but at least the half dozen zones around the country in which any 100 sq mi area has been hit by three F2s or stronger storms more than three times in the past 50 years might economically encourage sounder construction, IMO. I feel that any reasonable cost benefit analysis would find the expense justified, as would using rebar in new cinder block construction. Earthquake codes are expensive, but they’re why a 9 earthquake kills so many fewer people in Chile than a 7 in Haiti, despite being 100 times more energetic. New York City IMO should have emulated Providence, RI & built a storm surge barrier in the 1960s, realizing that hurricanes would once again hit the region. The cost of repairing & cleaning up after Sandy, to say nothing of lives lost, exceeds the expense of a barrier. …. Everything people learned in science class has been erased by this scam. The majority of humans don’t appear smart enough to question such ridiculous claims of the CAGWist front. Bob’s first question, right out of the gate, and he goes straight for consensus. I’m beginning to suspect that consensus causes CAGW. Just for point of interest, tornadoes occur in Canada as well, farther north than many people realize. In fact, one of the worst was in Edmonton, which is the farthest North of any large city in North America. It happened on July 31, 1987. Although it was considered an F4, it was definitely an EF5, with peak wind speeds measured at 258 MPH. Another was in Barrie, Ontario on May 31, 1985. Barrie is about an hour North of Toronto, and was the headquarters for Radio Shack (HUGE warehouse). When I was there for a course in 1989 they toured us through the devastated area, and that was sobering. Most of the time it was on the ground it was F3, but some areas had F4 damage. There was also a horrific tornado at Pine Lake, Alberta, about halfway between Calgary and Edmonton.That one was July 14, 2000. My parents were in the vicinity for a concert, and several friends were at the campground that was most directly affected. It was an F3. I can personally attest that those clouds were visible from here, almost 100 miles away. The only reason tornadoes aren’t as deadly here as in Tornado Alley is that there are fewer people and less property in the areas they frequent, but this is changing. My brother-in-law owns a small airplane, and when we fly I’m amazed at how many tornado tracks you can see from the air over Alberta. They’re especially obvious in forest areas. As more people move here and more build luxury homes in formerly uninhabited areas, expect the damage to increase… and expect people to claim that tornadoes are increasing. Generally speaking, most cold fronts that power Tornado Alley come past here, so technically we’re the entrance to the Alley. shows that there is a tremendous increase in reporting… although I admit some of the reports sound a bit ridiculous. A cartoon by Josh would be unseemly, given the terrible loss of life in Moore, OK, had Senators Boxer & Whitehouse not already shamelessly tried to exploit the tragedy by blaming the tornado on “climate change”. So how about Gore as the Wizard of Oz & Boxer as the Wicked Witch of the West whose flying monkeys, led by Whitehouse and including Mann, pursue Dorothy & Toto, plus the Scarecrow, the Tin Man & Cowardly Lion, representing, as in the book, farmers, workers &, instead of William Jennings Bryan, Mitt Romney, on the gold-bricked road to the Emerald City, shining green upon a hill? In Baum’s 1900 book, the slippers are silver. Oz is of course the abbreviation for ounce. The 1890s had been a bad decade for tornadoes. It also saw the rise of the Populists, who wanted to debase the currency. Imaginary Bernanke Bucks unhinged not only from gold but reason have succeeded far beyond the wildest dreams of bimetallists like Bryan in inflating the dollar supply, & most of the world is in a race to debase further their fictitious funny money. Here in Michigan we’ve had 3 “non-summer” summers where people on the lack didn’t even take their boats out it was so cool. My daughter turned 20 on April 21st and every single year the trees burst into leaf one or two days before that. This year it was May 7th, 2 and a half weeks late. Anecdotal i know but interesting no less. I submit that tornados are more likely to form during that part of the year when temperatures are rising to maximize the possibility of the warm/cold air collisions. Hence, May and June would be most likely. Now, whether more/stronger tornadoes would form as the AVERAGE yearly temperature increases would need long-term data analysis…but we certainly would not want to go there, now would we? I hate to gush, but, great thread everyone ! Carbon dioxide puts a spell on some people. You can recognize them by the dollar signs in their eyes. Carbon dioxide in action….. So Anthony Watts’ argument and graphs mean nothing. If Mr. Watts wants to dispute the warming/tornado connection, he should use the long term data that he so casually dismisses. BOB SCHIEFFER: Doctor Cullen, there’s no question that it’s getting warmer. Actually, there’s no question that its NOT getting warmer globally. According to various IPCC bigshots, the average global mean temperature has been flat for the past ten years, and there’s been no significant warming for the past 16. According to the Met Office, we can look forward to another five flat years, from 2013 through 2017. The sensors elsewhere around the world have been running around 270ppm, just as they have for some years. The 400 comes from the sensors at Mauna Loa, which is conveniently near Mauna Kea/Kilauea Iki, which has been in a major eruptive cycle. The sensors are measuring the outgassing from Kilauea. To get an idea of how much gas it is, consider that in order of magnitude, volcanic gases typically run from water vapor, carbon dioxide, sulfur dioxide. The sulfur dioxide alone has been causing VOG, volcanic fog, on Oahu some 200 miles away for more than ten years. The recent upsurge in gases has caused parts of the Park to close. Consistently, the sensors at Mauna Loa have read higher than the world’s average. It makes sense because they are mainly measuring Iki’s outgassing. As such, it’s nothing less than criminal data misrepresentation to claim that the world is at 400ppm, with the claim that it’s man who did it. http://cdiac.ornl.gov/ftp/trends/co2/Jubany_2009_Monthly.txt Readings are in the high 300s.